This Regional Strategic Framework (RSF) is a Framework for the development of the Region, for the period up to 2025. The approach embraces the opportunities that regional thinking should create. It also sets out the challenges being faced and the actions required to tackle those challenges. The RSF is linked to a number of other key plans and strategies. 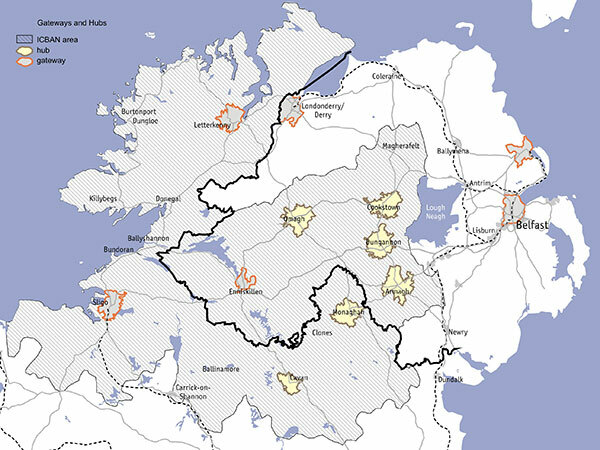 As a regional strategy for development it fits within the context of the spatial development plans of the two governments on the island of Ireland; i.e., the National Spatial Strategy for Ireland and the Northern Ireland Regional Development Strategy. It offers a sub-regional context to the ‘Framework for Co-operation – Spatial Strategies of Northern Ireland and the Republic of Ireland’ which has been agreed between the two governments. It also complies fully with the EU 2020 Strategy and offers a means of implementing EU 2020 policies at the regional cross-border level. This document has been driven by 10 local authorities from both sides of the border in the area known as the Central Border Region, working through their partnership organisation and Cross-Border Group, the Irish Central Border Area Network Ltd. (ICBAN). The RSF represents an affirmation of the commonalities of local authorities in working together in an essentially rural cross-border region. An additional local authority – Magherafelt District Council – is seeking to join ICBAN with effect from autumn 2013. While the analysis in this Regional Strategic Framework is based on data and the views of the existing 10 member authorities, Magherafelt District Council will be fully involved in the implementation of the Strategic Framework. Funded by the EU INTERREG IVA Programme under a Spatial Planning Initiative, the document commands the support of both governments, through the Department for Environment, Community and Local Government (Republic of Ireland) and the Department for Regional Development (Northern Ireland). The two governments have together provided this opportunity to create a framework for development in this cross-border area. The RSF responds to this opportunity in developing a Vision that will inform and effect policy change, and which will seek to replace the concept of a peripheral people with one of a region that can make a distinctive contribution to regeneration and growth of the island economy. In this way, the Regional Strategic Framework can be seen as an important local cross-border implementation arrangement for a variety of Governmental strategies and priorities such as the National Spatial Strategy, the Regional Development Strategy for Northern Ireland, the Action for Jobs Strategy and the Northern Ireland Economic Strategy. To identify opportunities for local authorities and other stakeholders to work together to realise opportunities and to respond to the challenges facing the area. This is particularly important in a cross-border Region where the existence of the Border may make it more difficult to work together across different legal and organisational structures. To enhance the potential to play a more involved role as an EU region, by not being peripheral in either a geographic or participative sense. There is a desire to embrace the learning potential within the EU through networking and engaging, as well as securing investments for key initiatives and projects. This will help implement the aims of EU 2020 Strategy and in particular cross-border programmes such as INTERREG. This RSF can assist in suggesting and identifying potential opportunities for further consideration and development by stakeholders. Make the case to the two Governments and the EU for investment in the Central Border Region on a consistent and evidence-informed basis. The implementation of the Framework will require effective cooperation between the authorities and other stakeholders in the Central Border Region, policy and decision makers in both national governments and those responsible for the allocation of resources to the area. The implementation of the Framework is considered in more detail in Section 8. The Framework is, therefore, based around developing a common strategic vision and advocating the case for investment in the Region. As a result of obtaining the financial and other resources necessary to make the vision into a reality, the Central Border Region will become more prosperous and offer a better future to its citizens.